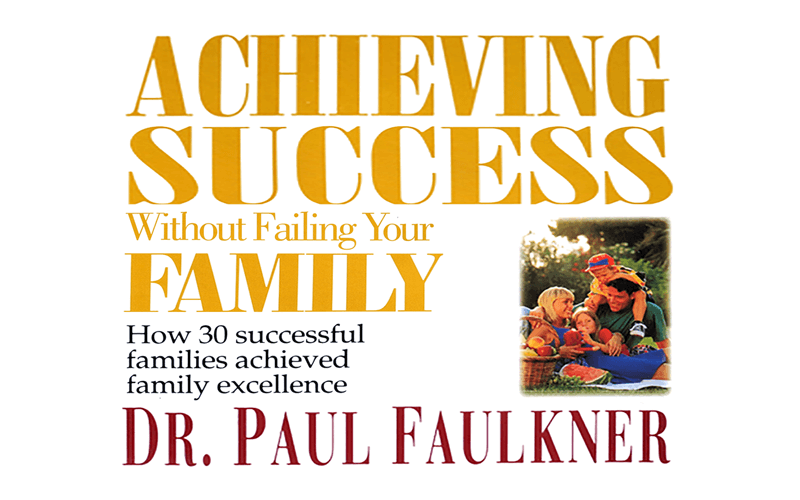 A noted speaker, writer, and professor of marriage and family therapy, Dr Paul Faulkner interviewed 30 sets of parents to discover how they raised vibrant families while achieving success at work. At the same time, he researched what makes families strong. This book, Achieving Success Without Failing Your Family–How 30 successful families achieved family excellence (1995), brings together insights from his research and counseling experience, offering a ‘wellness model’ with guidelines on what can go right for the family. Easy to read and grasp, the book is peppered with inspiring stories and quotations from the dads, mums, and kids he interviewed. Achieving Success Without Failing Your Family continues to be relevant to parents in Singapore today, especially in dual-career families, as it speaks on how to be intentional about parenting. The concept of intentionality is first introduced in chapter one, Parent on Purpose—Intentionally. Thereafter, it is woven into the chapters, especially 10 and 11, The Intentional Mother and The Intentional Father, respectively. Although based on Christian parenting values, the principles and strategies presented in the book are timeless and can be adapted for use in different households and faith communities. One of the main characteristics of parents who raise vibrant families is intentionality, which means knowing what one wants and aiming precisely to get it with all due diligence. Rather than parenting haphazardly, intentional dads and mums develop plans and goals concerning what kind of family they want to have. Parents with a focused mission set the tone and direction for the family. This prevents the children from being distracted as they grow and develop. With core values, families have a framework for all they do and who they are. As men are trained in almost every society to defend their families and countries, an intentional father is a protector. He is also a provider, moral leader, and a model of manhood to his children. By modeling manhood, the father confirms the femininity of his daughter and mentors his son’s development into adulthood. The intentional dad develops ‘antennae’ so that he may sense what is happening around him. He watches, listens, and becomes aware of his children’s non-verbal cues. He knows about details in their lives –names of friends, shoe-sizes, preferences, and names of pediatricians. Intentional fathers spotlight special times –they attend key events in their children’s lives, such as performances, celebrations, and competitions. At the same time, they know how to spotlight each child by getting to know him/her as an individual, spending together-time apart from other family members. Besides working on his parental role, an intentional dad remembers to spotlight his wife by paying attention to her and remembering special occasions such as her birthday, Mother’s Day, and their wedding anniversary. Just like planning ahead for important business deals, he takes the time and forethought to do something special and unique for his wife. Use Time Wisely – Children need a relaxed, spontaneous and unrushed atmosphere. Put aside work demands in the evening to concentrate on three evening touch-points: dinner, shared time and bedtime. Be Sensitive – Children need to know that their parents understand them. Because much of working parents’ time is spent away from home, it is essential for Dad and Mum to tune in to their children’s verbal and non-verbal cues. Concentrate on Communication – Seek creative ways to find out what the children are thinking about. One of the 30 families featured in the book organises mock television interviews at home for fun, with the parents as interviewers and the children acting as stars. Maximise Mornings and Homecomings – Take care of details the night before or wake up 30 minutes before the children. View morning routines as opportunities to interact with them and express love. Whether it is returning home from work in the evening or picking up a child from a daycare centre, focus on the child first rather than on the caregiver/teacher. Put First Things First – Conserve energy for what is most important, namely family interaction. Discern what tasks really deserve one’s best efforts. Build rest stops into the day and mini-vacations into the week so that tasks do not appear overwhelming. Make Take-Home Meals Special – There may not be time to prepare full-course meals on weekdays. But, the experience can still be pleasant and nurturing. Avoid serving takeaway food in its packaging. Enjoy the meal using the household cutlery and crockery. For a special touch, prepare a simple dish. Achieving Success Without Failing Your Family is packed with a hundred or so practical suggestions such as these, which can substantially change families’ lives.